41 North Frederick Street, Glasgow. There has been licensed premises on this site since 1863. William McLaws a wholesale and retail wine and spirit merchant traded from here, he also had licensed premises at 5 Cobden Street, 147 Garngad Road, 138 Garngad Road and 194 Cowcaddens. William lived with his family at Clover Bank House, Garngadhill, McLaws traded here until 1869. The pub was then taken over by John Slater, a New Monkland's man who was born in 1826, he lost his wife at an early age, but left him with a son called George, the pub was named after him. George took over the pub in the late 1880s. The pub stayed in the family until after the First World War. John Kennedy then took over the pub, he ran it successfully until the end of WW2. Robert Brown Chassels acquired the licence in 1946, he came from the well known family of Spirit Merchants and renowned members of the Scottish Licensed Trade and Hotelier's. Robert B Chassels was elected President of the Glasgow and District Licensed Trade Defence Association in 1966. 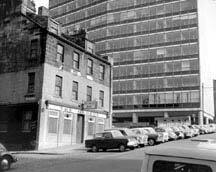 The pub was finally demolished in the 1970s. Members of the Camphill Ward. 1968. Left to right Mrs J Flynn, Mr J Flynn, Mrs Lockhart., middle row George Ramster, Miss McDowall and Mr Lockhart., top Mrs Chassels, R B Chassels, Mrs Ramster and W J McDowall. Robert B Chassels, former treasurer and junior vice-president of the SLTA was honoured by the office bearers at a lunch in Edinburgh to mark his services. Mr Chassels who had to demit office when he sold his business, was presented with a digital clock radio by the president, Arthur Squire, on behalf of the office-bearers. Other in the picture left to right William Meikle, treasurer, Morris Barr, past president, Mrs Helen Preston, junior vice-president, J C Ross, senior vice-president and Eric Ridehalgh, secretary. 1974. Flying Officer Robert Brown Chassels, grandson of Mirrlees Chassels, J.P, and proprietor of the Clyde Hotel, Bothwell. Mr Chassels married Miss Frances Simpson in 1944 at Sandyhills Church, Mount Vernon. Mr Robert B Chassels. 1966.